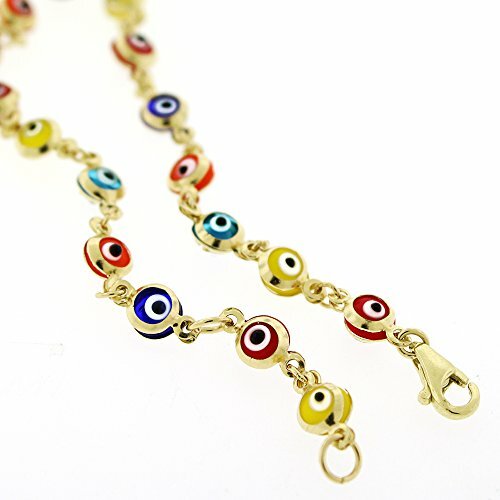 14k Yellow Gold Childrens 4mm Multi-Color Evil Eye Bead Good Luck Charm Bracelet Chain 6"
In Style Designz is part a large manufacturer and importer of Diamonds, 14k, 10k, Sterling Silver, and Stainless Steel jewelry. We cater to all your needs in all jewelry categories. We take pride in our quality, care, competitive pricing, and prompt of service to our customers. You will not find a better one-stop shop for fine and fashion jewelry than In Style Designz. [ BRACELET INFO ] 4mm wide, Size 6". Weighs approx. 2.5 grams. Crafted from Pure 14k Yellow Gold, a Premium & Sturdy Metal. A High Polish Finish adds a Fine Luster & Sharp Touch. Lobster Lock Closure for safety and security. A great choice for Girls & Children. Gift Packaging Included - Perfect for sending it as a gift! If you have any questions about this product by In Style Designz, contact us by completing and submitting the form below. If you are looking for a specif part number, please include it with your message.